The city of Lewiston named its downtown park for President John F. Kennedy on Dec. 3, 1963, 13 days after Kennedy’s assassination. 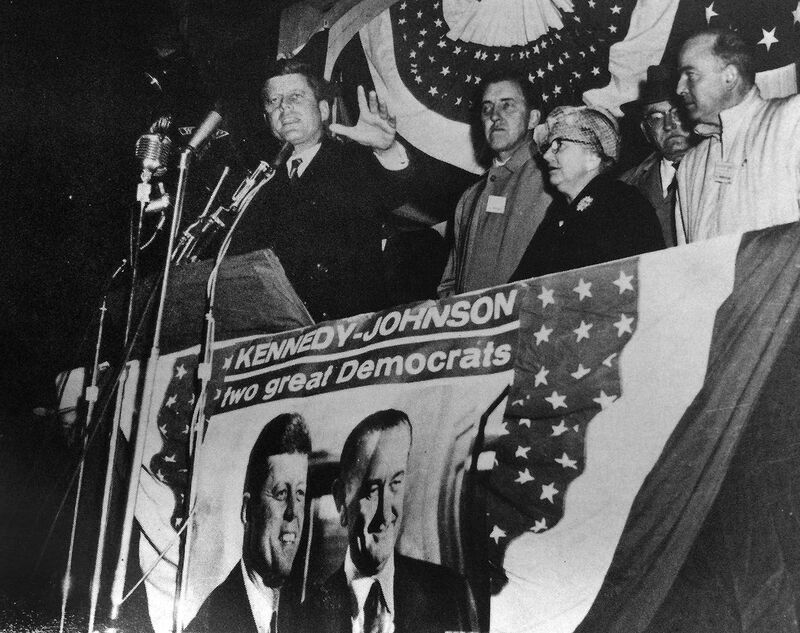 On Sunday, Nov. 6, 1960, two days before the presidential election, then-candidate Kennedy visited Lewiston to speak at the city park. A massive crowd of 14,000 gathered for his 9 p.m. talk, but Kennedy didn’t arrive until midnight. Even then, 8,000 remained — a “shivering throng,” according to the Lewiston Daily Sun. 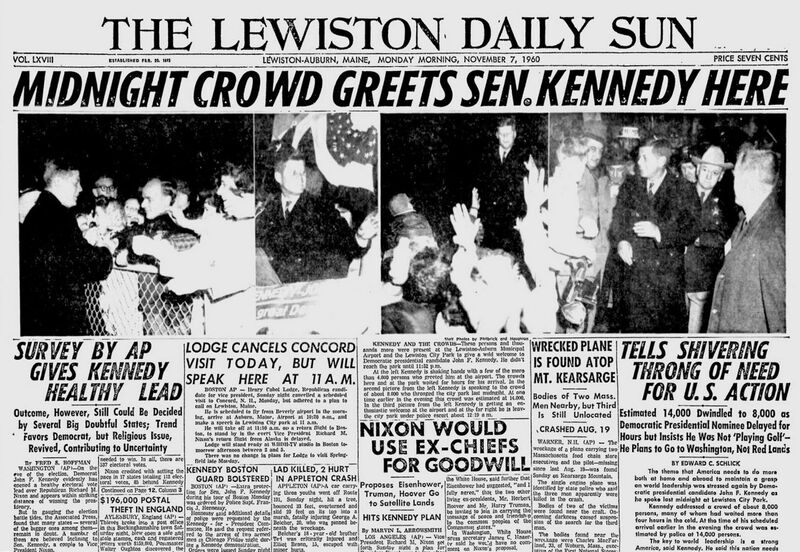 The Nov. 6, 1960, front page of the Lewiston Daily Sun tells of John Kennedy’s visit to Lewiston. 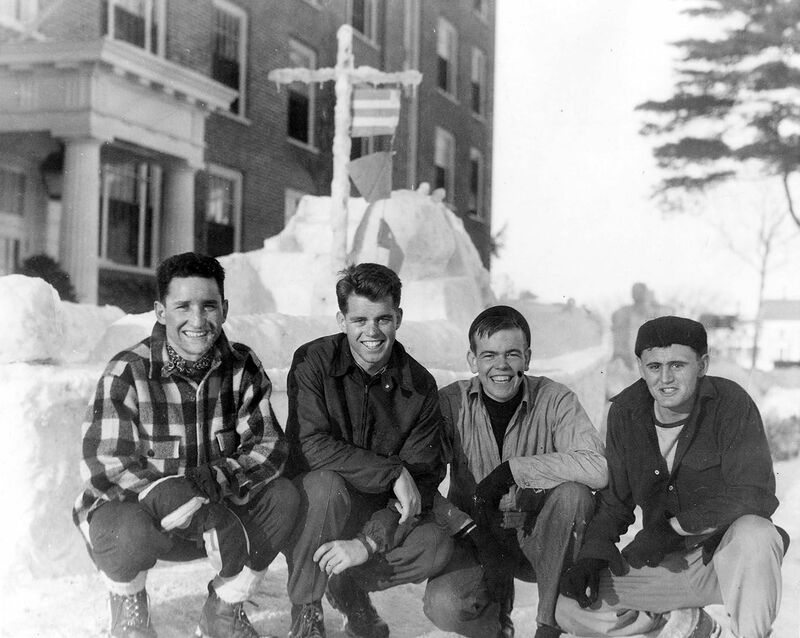 In 1960, Bates women had a strict curfew (men did not), which was monitored by dorm housemothers. In Milliken House, Judith Hollenback Yarnall ’62 and some friends headed downtown anyway. She doesn’t remember what Kennedy said. But she does recall how he said it. The candidate’s Boston accent “was so thick my Pennsylvania ears could barely make it out,” Yarnall wrote in the Class Book for the Class of 1962’s 50th Reunion in 2012. Returning to Milliken after midnight and well after curfew, Yarnall found a locked Milliken. She feared punishment from her housemother, a woman considered aloof and severe. But after a brief verbal scolding, the housemother offered the cold students hot tea and conversation. “We found a kind heart in a person we had perceived as a reclusive dragon,” Yarnall wrote. Kennedy flew into the Auburn-Lewiston Municipal Airport, where 4,000 supporters had gathered to greet the candidate. The crowd, which delivered an “ear-deafening explosion of sound” as Kennedy landed, included a “semi-trailer truck loaded with Colby College students,” who sang Colby songs during the long wait for the candidate, reported the Daily Sun. 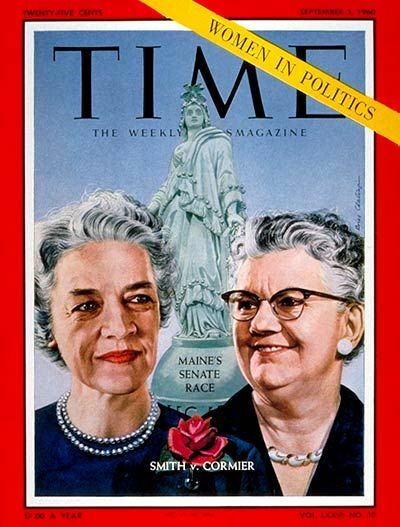 Maine’s U.S. Senate race between Margaret Chase Smith and Lucia Cormier attracted national attention, including this cover story in TIME. In the presidential election, Kennedy easily took Lewiston over Richard Nixon, 16,441 to 3,262. But the latter narrowly took Auburn (5,622 to 5,589) and, decisively, the state of Maine (240,608 to 181,159), as did all statewide Republican candidates that year, including Sen. Margaret Chase Smith over Lucia Cormier (in the first-ever Senate race between two women), and John Reed, who defeated the late Frank Coffin ’40 for governor. John Kennedy wasn’t the first or the last Kennedy sibling to visit Lewiston. During World War II, his brother Bobby was a member of the U.S. Navy’s V-12 program at Bates during World War II, where he and other sailors received accelerated officer training along with college instruction. 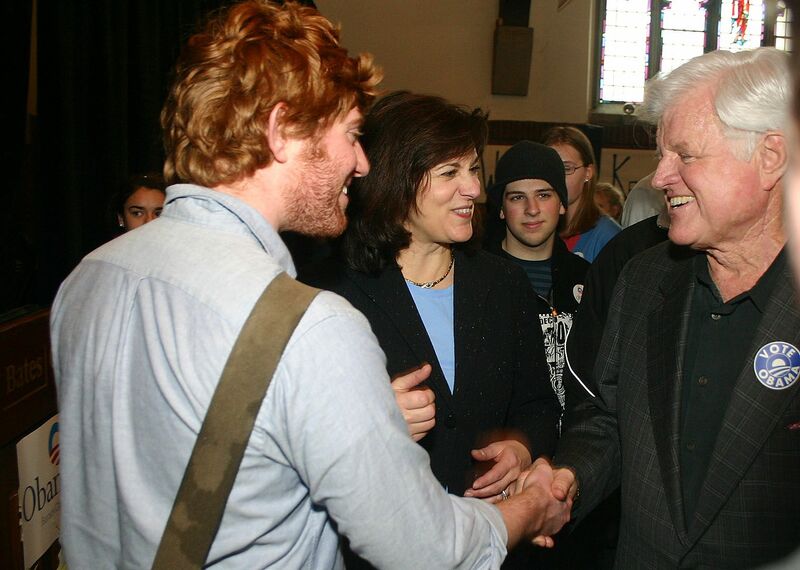 On Feb. 8, 2008, the late U.S. Sen. Ted Kennedy, D-Mass., spoke in the Chapel in support of Barack Obama, 11 days after Kennedy’s first endorsement of the future president. What is now Kennedy Park is the site of one of the first U.S. monuments to commemorate the Civil War. 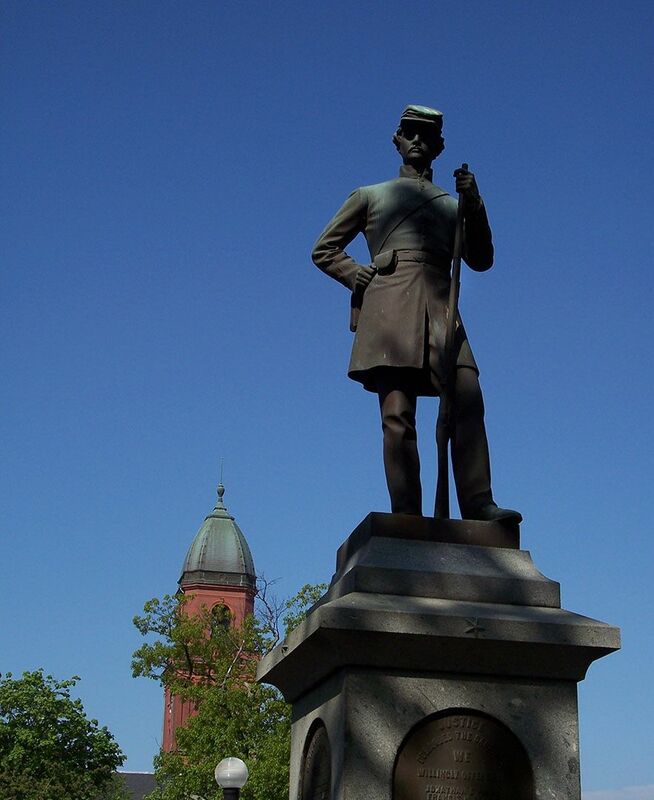 Dedicated in Lewiston on Feb. 28, 1868, the Soldier’s Monument, a life-size bronze statue depicting a Union soldier, was designed by renowned Maine-born sculptor Frank Simmons, an alumnus of the Maine State Seminary. A version of this story appeared in the Fall 2017 issue of Bates Magazine.